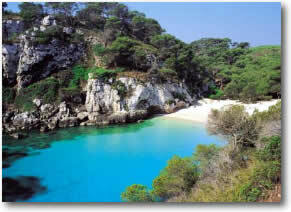 A Spain Yacht Charter Destination in Ibiza, Mallorca, Balearic Island is a wonderful Getaway Sailing Itinerary. The passions of Spanish culture and the awesome backdrop of the azure Mediterranean make a yacht charter in Spain dazzling. Hear the lively strum of the Flamenco guitar, imagine the flowing Flamenco skirts, the swish of red from the Matador’s cloak, the sip of sangria, taste of tapas, the aroma of olive groves, and the expressive personalities of the Spanish people. Everything about Spain is vibrant. Excellent yacht charter destinations from mainland Spain include Costa Brava, Costa Blanca, Costa del Sol and the Balearic Islands. Recent additions of modern marinas along the coast welcome sailing and motor yacht charters in style. Valencia’s host to the America’s Cup has added further infrastructure development on Spain’s Mediterranean Eastern Coast. 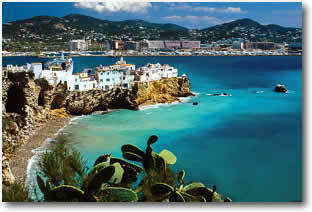 From Valencia, you can sail down the coast to Costa del Sol or up to Costa Blanca. From Barcelona easily sail down the coast, to Costa Blanca, up to Costa Blanca, or across to the isolated bays of the Balearic Islands. The northern Catalonian city of Barcelona, Spain’s second largest city, is a wonderful launching base for a yacht charter vacation. The Gothic and Medieval architecture and lively culture and nightlife of Barcelona are renowned. Spain’s yacht charter season runs from April to the end of October, like most of the Mediterranean. The high summer season is July and August when it is the hottest and usually has lighter winds. Consider also the quieter shoulder seasons (April-May and September-October). The Balearic Islands of Spain; Mallorca, Ibiza, Formentera, Menorca and smaller cays, are a favorite Mediterranean yacht charter holiday. The golden beaches and rugged coastal beauty, picturesque villages with ancient cobbled streets steeped in history and modern Spanish nightlife make for pure enjoyment no matter your interests. Play in the warm sunshine and clear blue waters along the bold towering coastlines, where you will find endless coves and beaches for anchoring your yacht. Stroll the secluded beaches of Formentera and Cabrera, or meander your way through the narrow cobbled streets with port side cafes in Cindadella port or Mahon. On Mallorca, the Port D’Andratx is a trip back in time to a quaint working fishing village with stylish boutiques, cafes and tapas bars. Just outside the port lie the islands of Dragonera, which is National Park and worth exploration as well. You may come and go from your yacht at the historic capital of Palma De Mallorca marked by its balance of traditional and modern avant-garde culture. Be sure to see the museums, art galleries, Arab baths, the gothic cathedral and partake in the festivals that regularly occur in this entertaining Spanish city. 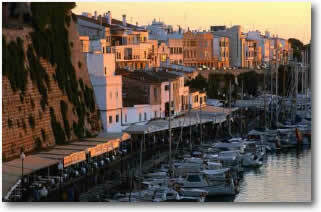 It is easy to get to your yacht in the Balearics as Mallorca has its own International airport, minutes away from Palma. There are direct flights to Mallorca from any European airport. Since there are so many convenient and wonderful ways to enjoy a motor or sailing yacht vacation in Spain what is stopping you? Hear the flamenco guitar calling? Browse the available crewed sailing and motor yachts for a Spain Yacht Charter Itinerary with a Yacht Search.